Orbital injuries with retained foreign bodies (FBs) are relatively uncommon; however, they can be associated with severe ocular morbidity. Many cases of orbital FBs are work-related or follow high-velocity gunshot injuries,,,, but occasionally, they could be due to road traffic and domestic accidents. Various types of intraorbital FBs (IOrbFBs) had been reported in literature, and the mechanism of injury is either as flying objects with sufficient force to penetrate the orbit or by direct forced orbital entry., IOrbFBs could be classified as metallic (e.g., iron), nonmetallic inorganic (e.g., glass), or organic (e.g., wood). While inorganic FBs generally cause ocular morbidity by direct effect of the FBs, organic materials, in addition to direct injury, are associated with higher incidence of orbital infection., Some unusual IOrbFBs reported in literature include motorcycle hand brake, bicycle hand brake, firearm, projectile splinters from a glass door, and a circular saw. In this case series, two patients with unusual IOrbFBs who were successfully managed in our facility with satisfactory visual outcome are reported. 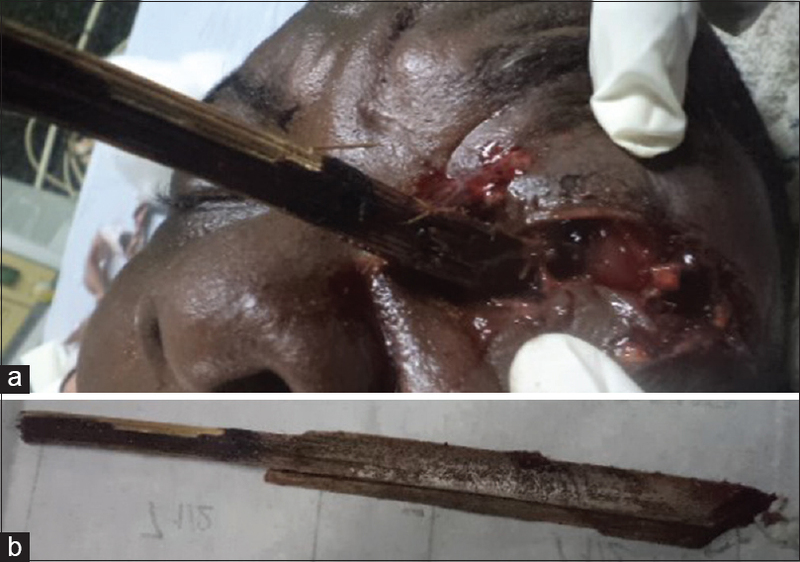 A 45-year-old man presented with an 8-h history of penetrating injury to the left orbit with a bamboo stick following a road traffic accident when he drove into a stationary truck loaded with bamboo logs. The ocular examination of the left eye revealed visual acuity of light perception, multiple eyelid lacerations, and penetration of the orbit by a long piece of bamboo stick through a medial infraorbital entry wound. There were marked periorbital edema, conjunctival chemosis, and corneal edema; however, the globe appeared intact [Figure 1]a. Detailed ocular examination was deferred to avoid further ocular damage, and he was commenced on parenteral antibiotics and analgesics, oral antifungal, and had tetanus prophylaxis. Computed tomography (CT) scan of the orbit showed the intraorbital wooden FB (IOWFB) extending from the inferolateral/inferior orbit through the lateral orbital wall into the infratemporal fossa, fracture of the lateral orbital wall, and severe orbital soft-tissue swelling but no affectation of the eyeball. He had immediate orbital exploration under general anesthesia. At surgery, an orbital injury with a 19.5 cm bamboo stick which entered the orbit at the medial canthus and proceeded inferiorly and laterally into the infratemporal fossa fracturing the lateral orbital wall was noted. There was no direct injury to the eyeball. The bamboo stick was removed as a single piece after blunt dissection [Figure 1]b and copious saline irrigation of the wound was done. The wound was sutured in layers with 6/0 vicryl and 6/0 prolene sutures. On the 1st postoperative day, visual acuity was hand movement, with severe edema of the eyelids, conjunctival chemosis, and restricted ocular motility. He commenced topical antibiotic, cycloplegic, and steroid medications, and by the 11th postoperative day, the visual acuity was 6/24 which improved to 6/18 with pinhole. Wound healing and ocular motility were satisfactory, indirect ophthalmoscopy showed a pink disc with normal retina, and he was discharged to outpatient clinic. At his last follow-up visit 6 months postoperatively, the unaided visual acuity in the left eye had improved to 6/9 with full ocular motility. A 22-year-old male presented to the eye clinic with 1-month history of the left eye trauma. He was struck with a pair of scissors while playing with a friend resulting in the left eyelid lacerations and reduced vision. The lacerations had been sutured at an outside facility before presenting to us, and ocular examination revealed visual acuity of 6/18 in the left eye, a healed scar on the upper eyelid, moderate ptosis, chemosis, and a fleshy growth in the inferolateral aspect of the orbit with restriction of the ocular movement laterally. The right eye was essentially normal. Otorhinolaryngological examination revealed profuse mucopurulent discharge in the left nasal cavity. Ocular ultrasound showed a left nasal wall mass and a suspected retained IOrbFB. He was treated with topical and intravenous ciprofloxacin and topical dexamethasone. He was, however, lost to follow up before any further intervention could be carried out and represented 2 years later with complaints of recurrent discharge, redness, and a persistent fleshy growth in the left eye. Visual acuity had reduced to 6/36 in the eye while other findings were still the same. A plain radiograph of the orbit and paranasal sinuses was done as the patient could not afford a CT scan, and this showed a radiopaque inferior orbital FB with the sharp end pointing posteriorly and inferomedially into the left nasal cavity through the maxillary sinus [Figure 2]a. There was associated opacity of the left maxillary sinus suggestive of chronic maxillary sinusitis from the FB. A diagnosis of the left sino-orbital FB with left maxillary sinusitis was made, and he subsequently had exploration and extraction of the FB under general anesthesia as a joint procedure by the ophthalmologists and otorhinolaryngologists. At surgery, the rusty, broken tips of a pair of scissors measuring 55 mm × 8 mm × 3 mm [Figure 2]b were removed through a transcutaneous incision below the left lower eyelid which exposed the FB traversing the orbital floor into the nasal cavity. The fleshy tissue in the inferior conjunctival fornix was excised and the defect repaired. The patient also had a left intranasal antrostomy for the maxillary sinusitis. He fared well postoperatively and the vision in his left eye improved to 6/12 with refraction. The clinical presentation of IOrbFBs varies widely and depends on the type of FB and its location within the orbit which to a large extent, is determined by the mechanism of injury.,, The two patients in this series were young male adults in conformity with the demographic profile of the patients with IOrbFB. Orbital injuries with retained FBs are associated with varying degree of ocular morbidity and visual loss,,, and the subsequent effect of the IOrbFB depends on the nature and composition of the FB and its size and location within the orbit. In general, it is advised that all organic FBs should be surgically removed while some metallic inorganic FBs can be managed conservatively if there are no indications for their removal.,,, Most metallic FBs are inactive, but organic materials such as wood can present with late complications such as orbital granuloma, cellulitis, abscess, and discharging sinus.,, Thus, the risk of surgical exploration and removal is usually weighed against the benefits, especially with a background of good visual potential. Large-sized FBs as well as anteriorly located FBs which can easily be accessed are recommended for removal while posteriorly located FBs could be managed conservatively. The type of metallic FB also affects the decision to manage the patient surgically or conservatively. Foreign bodies recommended for surgical removal include copper-containing FBs which may induce severe inflammation, lead FBs which have propensity for systemic toxicity, and iron FBs with a potential risk of visual loss from siderosis., The other factors related to the exploration and surgical removal of IOrbFBs are FB-related complications and the presence of other injuries., Our first patient had surgical removal of the IOrbFB on account of its vegetative nature, large size, and extension into the infratemporal fossa while exploration and surgical removal was indicated in the second patient on account of its large size, recurrent orbital infection, and chronic maxillary sinusitis. Although one out of six cases of penetrating orbital injuries is associated with retained FBs, IOWFBs are uncommon., Infection complicating IOWFBs is well established in literature because complete removal of fragments of the wood may not be possible, thus serving as a nidus for recurrent orbital infection. However, the case with IOWFB in this series was not complicated by orbital infection after removal. This could be attributed to early presentation and prompt surgical exploration of the patient and the type of the wooden FB, a bamboo stick which was removed as a complete piece with no remnant fragments. The CT scan is the standard imaging study in cases of suspected IOrbFBs due to its ability to demonstrate FBs of small size and its safety in cases of metallic FBs. It clearly demonstrates the position and orientation of the FB within the orbit, its topographic relationship with other structures, and other associated injuries., Some authors,, however, opined that magnetic resonance imaging scan better demonstrates wooden FBs and very small-sized FBs (<0.5 mm) and thus should be the primary imaging study in suspected cases of IOWFBs or in cases that are negative on CT scan. CT scan was done in our first case with the large wooden FB impacted into the orbit, and it demonstrated the depth of penetration and the orbital wall fracture. Regarding our second case, financial constraints made it impossible to assess him with a CT scan; however, preoperative localization of the FB was achieved with plain radiographs, thereby enhancing its successful surgical removal. Plain radiographs are useful in assessing multiple FBs in the orbit  and are the first-line imaging procedures in many centers in developing countries due to the low cost and easy accessibility. A detection rate of 69%–90% for metallic FBs and 0%–15% for organic FBs had been reported with plain radiograph; however, it lacks the ability to give details of the exact location of the FB, its relation to adjacent structures, and the tissue reaction to the presence of the FB. Ultrasonography is another imaging technique used in IOrbFBs, but it may only be adequate to localize superficial FBs. Preservation of visual function is important in the overall management of IOrbFBs, and factors which affect the prognosis and visual outcome in these cases include early presentation of patients and prompt intervention. Although our first case presented with poor visual acuity and a large IOWFB, early presentation and prompt surgical intervention possibly contributed to the good visual outcome, while the second case with a long-standing retained metallic IOrbFB had good vision after treatment. Of note in both cases is that no direct injury to the eyeball or other vital structures in the orbit occurred at the time of initial trauma. It has been reported in literature that orbital injuries sparing the eyeball resulted in preservation of vision after surgical removal of the IOrbFB when compared with those associated with direct injuries to the globe. Delayed complications resulting from IOrbFBs include chronic orbital inflammation, osteomyelitis, recurrent orbital soft tissue infection, and cerebral infections. However, no delayed complications were seen in the two cases, partly due to prompt intervention of Case 1 and the nature of the FB in Case 2. A major challenge in the management of our second case was financial constraints resulting in surgical removal of the FB 2 years after the initial trauma despite having presented first within 1 month of injury. Cost of treatment had been a major issue in the management of ophthalmic patients in the region. Retained FBs in the orbit can result from penetration of various objects through the anterior orbit. A suspicion of IOrbFB should be borne in mind when a patient presents with penetrating eyelids injury even if the wound has healed. Early presentation and prompt management of patients with penetrating orbital injuries improve prognosis and the chances of visual recovery. Cooper W, Haik BG, Brazzo BG. Management of orbital foreign bodies. In: Nesi FA, Levine MR, Lisman RD, editors. Smith's Ophthalmic Plastic and Reconstructive Surgery. St. Louis, MO: Mosby; 1998. p. 260-9. Finkelstein M, Legmann A, Rubin PA. Projectile metallic foreign bodies in the orbit: A retrospective study of epidemiologic factors, management, and outcomes. Ophthalmology 1997;104:96-103. Lindner D, Winkler D, Meixensberger J. 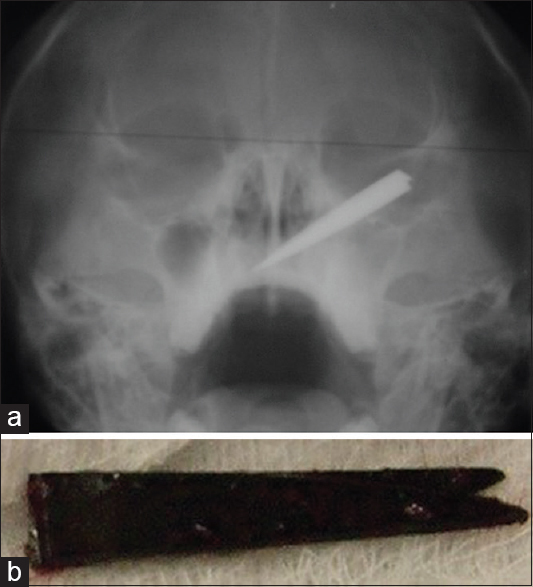 Unusual penetrating cranio-orbital injury by a cut-off wheel. J Craniofac Surg 2004;15:226-8. Fasina O. Bilateral orbito-ocular gunshot injury in a Nigerian male: Case report and review of literature. East Afr Med J 2013;90:33-6. Michon J, Liu D. Intraorbital foreign bodies. Semin Ophthalmol 1994;9:193-9. Naik MN, Das S, Oluyemi F, Honavar SG. An extraordinary orbital foreign body. Ophthal Plast Reconstr Surg 2011;27:e149-52. Elkington AR, Khaw PT. Injuries around the orbit: More than meets the eye. Br Med J (Clin Res Ed) 1987;295:1652. Nasr AM, Haik BG, Fleming JC, Al-Hussain HM, Karcioglu ZA. Penetrating orbital injury with organic foreign bodies. Ophthalmology 1999;106:523-32. Ng JD, Payner TD, Holck DE, Martin RT, Nunery WT. Orbital trauma caused by bicycle hand brakes. Ophthal Plast Reconstr Surg 2004;20:60-3. Motamedi MH. Primary management of maxillofacial hard and soft tissue gunshot and shrapnel injuries. J Oral Maxillofac Surg 2003;61:1390-8. Markowski J, Dziubdziela W, Gierek T, Witkowska M, Mrukwa-Kominek E, Niedzielska I, et al. Intraorbital foreign bodies-5 own cases and review of literature. Otolaryngol Pol 2012;66:295-300. Santos Tde S, Melo AR, Moraes HH, Almeida Júnior P, Dourado E. Impacted foreign bodies in orbital region: Review of nine cases. Arq Bras Oftalmol 2010;73:438-42. Fulcher TP, McNab AA, Sullivan TJ. Clinical features and management of intraorbital foreign bodies. Ophthalmology 2002;109:494-500. John SS, Rehman TA, John D, Raju RS. Missed diagnosis of a wooden intra-orbital foreign body. Indian J Ophthalmol 2008;56:322-4. Bullock JD, Warwar RE, Bartley GB, Waller RR, Henderson JW. Unusual orbital foreign bodies. Ophthal Plast Reconstr Surg 1999;15:44-51. Ho VH, Wilson MW, Fleming JC, Haik BG. Retained intraorbital metallic foreign bodies. Ophthal Plast Reconstr Surg 2004;20:232-6. Orcutt JC. Orbital foreign bodies. In: Linberg JV, editor. Oculoplastic and Orbital Emergencies. Norwalk: Appleton and Langel; 1990. p. 183-97. Cartwright MJ, Kurumety UR, Frueh BR. Intraorbital wood foreign body. Ophthal Plast Reconstr Surg 1995;11:44-8. Jacobs NA, Morgan LH. On the management of retained airgun pellets: A survey of 11 orbital cases. Br J Ophthalmol 1988;72:97-100. Ho VT, McGuckin JF Jr., Smergel EM. Intraorbital wooden foreign body: CT and MR appearance. AJNR Am J Neuroradiol 1996;17:134-6. Shelsta HN, Bilyk Jr., Rubin PA, Penne RB, Carrasco JR. Wooden intraorbital foreign body injuries: Clinical characteristics and outcomes of 23 patients. Ophthal Plast Reconstr Surg 2010;26:238-44. Hansen JE, Gudeman SK, Holgate RC, Saunders RA. Penetrating intracranial wood wounds: Clinical limitations of computerized tomography. J Neurosurg 1988;68:752-6. Gekeler F, Cruz AA, de Paula SA, Dos Santos AC, Chahud F. Intraconal grease-gun injury: A therapeutic dilemma. Ophthal Plast Reconstr Surg 2005;21:393-5. Green BF, Kraft SP, Carter KD, Buncic Jr., Nerad JA, Armstrong D, et al. Intraorbital wood. Detection by magnetic resonance imaging. Ophthalmology 1990;97:608-11. Moretti A, Laus M, Crescenzi D, Croce A. Peri-orbital foreign body: A case report. J Med Case Rep 2012;6:91. Bray LC, Griffiths PG. The value of plain radiography in suspected intraocular foreign body. Eye (Lond) 1991;5(Pt 6):751-4. Al-Mujaini A, Al-Senawi R, Ganesh A, Al-Zuhaibi S, Al-Dhuhli H. Intraorbital foreign body: Clinical presentation, radiological appearance and management. Sultan Qaboos Univ Med J 2008;8:69-74.